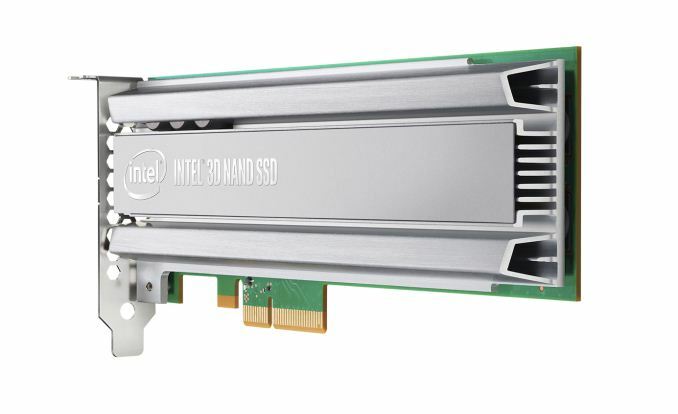 Intel has announced the most significant updates to their enterprise PCIe SSD lineup since the launch of their first NVMe SSDs. The new Intel SSD DC P4500 and P4600 are the successors to the P3500, P3600 and P3700 series, modernizing the product line with a new SSD controller and 3D NAND flash across the full range of models. Most of Intel's datacenter PCIe SSDs have still been using 20nm MLC NAND flash, though the P3500 did get replaced with the P3520 using Intel's 3D MLC. The new P4x00 generation moves everything over to Intel's 32-layer 3D TLC NAND flash. With a per-die capacity of 384Gb (48GB) compared to 128Gb (16GB) for Intel's 20nm MLC, it's no surprise to see greatly expanded capacities: where the old P3x00 generation offered capacities from 400GB to 2TB, the new P4500 and P4600 start at 1TB and initially offer up to 4TB, with 8TB models expected by the end of the year. Enterprise SSDs have mostly used MLC NAND for the past several years since SLC was abandoned by the market, but Intel's decision to go with 3D TLC for all of the new enterprise PCIe SSDs is not entirely unprecedented. A few months ago Micron's new generation of enterprise SATA SSDs was announced with 3D TLC used for even the highest-endurance models rated for five drive writes per day. Samsung also uses 3D TLC for their flagship PM1725a enterprise NVMe SSD. With the Optane SSD DC P4800X now covering the high-performance market segment using 3D XPoint memory instead of flash memory, it makes sense for Intel to choose the higher capacity offered by TLC and make up any deficit in write endurance with greater overprovisioning. The flash memory used in Intel's previous generation of datacenter PCIe SSDs wasn't the only outdated component. With the exception of the dual-port DC D3700 and D3600 and the very low-end DC P3100, Intel's entire lineup was still based on their first NVMe controller that debuted in the P3700. That controller was responsible for the 2TB limit that is inadequate in today's market (and was circumvented by the dual-controller P3608). Intel hasn't said what the maximum drive capacity supported by the new controller is, but they mention that a 16TB U.2 drive should be possible with the current generation of 3D NAND and even higher capacities will soon be possible (if not economical) from the upcoming 512Gb 64-layer 3D TLC. The new controller only provides 12 channels for connecting to the flash memory, down from the 18 channels offered by the previous generation but still substantially higher than the channel count of client/consumer-oriented NVMe controllers. Any potential loss in throughput from the lower channel count is offset by each channel now supporting the faster ONFI 4.0 interface, and the new SSDs can hit sequential read speeds of up to 3290 MB/s compared to 2800 MB/s for the Intel P3700. Since the launch of the Intel SSD DC P3700, the NVMe specification has expanded significantly, and the new controller powering the P4500 and P4600 adds quite a few new optional features from the 1.1 and 1.2 revisions of the NVMe standard. The basic functionality has also been enhanced by expanding the range of NVMe commands that are hardware-accelerated with little or no firmware involvement, and by increasing the number of queues supported from 32 to 128 (still with a maximum of 4k commands per queue). The higher queue count will help reduce contention in systems with very high CPU core counts as it is standard practice for NVMe drivers to allocate one queue per core. The biggest new feature set supported by the P4500 and P4600 is full support for the NVMe Management Interface standard for out-of-band management over PCIe or SMBus. This allows IPMI-equipped servers to offer full access to the drive's SMART data and firmware updating through the BMC regardless of the operating system running on the server. The new SSDs now also support multiple NVMe namespaces (up to 128), a drive-managed partitioning scheme that is primarily useful for virtualization scenarios. Intel's previous NVMe SSDs all supported thermal throttling, but now this is exposed and configurable through the standard NVMe power state mechanism, which allows drives to declare numerous power states—both operational and idle—along with the maximum power consumption of the drive in each state and the latency of switching in and out of idle states. The P4500 and P4600 bring support for multiple firmware slots and firmware updates without requiring a full PCIe bus reset, allowing the firmware update process to be safer and quicker and also opening the door to the possibility of toggling between firmwares tuned for different roles. The new SSD controller also brings encryption support, and Intel promises a future firmware update will deliver TCG OPAL functionality. Taking a look at the performance specifications, the P4500 and P4600 fit in to the usual pattern of having a lower model that is intended for more read-heavy workloads while the higher model is tuned for better performance and write endurance on write intensive workloads. Both drives benefit from substantially improved sequential and random read performance compared with the previous generation, but the P4500 has a slight edge. The P4600 has a moderately better sequential write speed and much better random write speed than the P4500 or last generation's P3700. Peak power consumption is down a bit from the 25W for writes that the largest of the last generation drives required, and when comparing at equal capacity the new P4x00 generation should be substantially more power efficient. The 0.7 DWPD rating of the P4500 is a significant improvement over the 0.3 DWPD rating of the P3500 and on par with the 3D MLC-based P3520. The P4600 covers the performance role of both the P3600 and the P3700, but its endurance is only in the ~3 DWPD class of the P3600, not the 17 DWPD offered by the P3700. For extreme write endurance, Intel's recommended solution is now the Optane SSD DC P4800X at 30 DWPD. Intel hasn't disclosed pricing yet, but with a smaller controller and 3D TLC instead of 20nm MLC, the P4500 and P4600 should easily be able to offer a better value than Intel's aging first-generation NVMe SSDs.